← My boy lovebird, Pipsqueak, is trying to hatch eggs. Pipsqueak just ran out on Shelly! 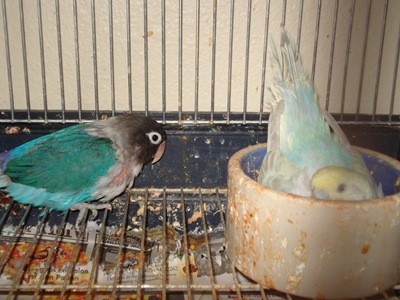 Pipsqueak used to live with the parakeets, but he picked on them way too much. He would chase them around and pull their tails and bite their feet. I took Pipsqueak and his girlfriend out of that house, and put them in their own house next door. They have lived together, just the two of them, for a year or so. But, Pipsqueak just lifted up the cage door of his house and went next door to the cockatiel cage. He hung out there for a while, then crossed back over his house to the house where the rest of the parakeets live. He lifted up the door of the parakeet cage and just went in. I guess marriage is taking its toll on him. The thing is, my six other parakeets, besides Pipsqueak’s mate Shelly, are all paired up in three committed relationships. If Pipsqueak thinks he’s going to have a beer with the guys, he is going to have to get the girls to agree to it, first. Maybe in a day or so, Pipsqueak will show up at the foot of the stairs in a torn, dirty T-shirt, hold his head in his hands and yell, Shellllll-llllly!! Then, Shelly will come down the stairs and hold him and then they will slowly walk up the stairs together. Take that, Tennessee Williams!